The Foresters Arms is located in the picturesque village of Carlton in Coverdale in the North Yorkshire Dales nestled under the peaks of Roova Crags and Penhill. The pub shut early in 2011 after having been an Inn since the 17th century and the Coverdale Community looked into ways in which the pub could be saved. The overwhelming view of the 80 residents who attended the initial meeting was that we should try, in some way, to purchase the Foresters Arms for the community, and bring it back to life. This website is designed to serve as a communication portal for our efforts to save the pub. Please check out our newsletter section for more information on how you can get involved and help the cause. 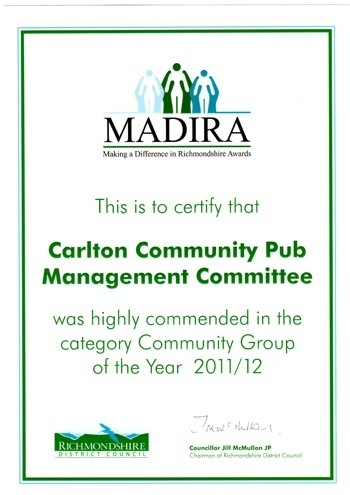 The management committee of the Coverdale Community Pub were recognised in the 2011/2012 MADIRA awards. The Richmondshire District Council has awarded the committee a highly commended certificate in the Community Group of the Year Category. This category is aimed at groups of people who have come together to solve a problem or respond to an opportunity which has benefited their community. The Foresters is now open! Don't call us - call them! The pub is now fully operational with the bar, kitchen, tenant accommodation and three letting rooms complete. First of all we would like to thank all of you, the supporters of the Coverdale Community Pub, for all of your generous help and support over the last year. We set out in March 2011 to rescue the Foresters Arms, secure it for us all for the future and create a quintessentially English country pub offering a warm welcome, good food and serving local beer. We think, through everyone's hard work, that we have achieved what we set out to do. We should all be proud of what we have accomplished, a beautiful country pub, saved by the people, owned by the people and used by the people. Their website is now up and running so please drop by to see how things progress! Don't forget to sign up to their Facebook page and follow developments there as well!